Targeted at small families who want the comfort, practicality, and space of a sedan, but don’t want to splurge any additional and large sum of money, the Perodua Bezza is one such vehicle to fulfill their needs. This entry-level sedan might not be the best one to look at, when it comes to exterior visual appeal, thanks to its very simple and functional design. The same impression can be senses when stepping in the cabin of the Bezza. However, the Bezza manages to score high when it comes to the practical aspects like fuel efficiency, space and interior cabin comfort. The Perodua Bezza is blessed with two petrol engine options – while the smaller 1.0-litre three-cylinder unit produces 68 PS of power and 91 Nm of torque, the bigger 1.3-litre four-cylinder mill generates 95 PS of power and 121 Nm of torque. Both these engines are available with the choices of manual as well as automatic gearboxes. Have a question on Bezza? Bezza is available in 6 different colors - Ocean Blue, Ebony Black, Glittering Silver, Ivory White, Lava Red and Sugar Brown. Bezza is the first EEV (Energy Efficient Vehicle) Sedan produced by a Malaysian automobile manufacturer, Perodua. The Bezza was officially launched in July 2016 and has been one of the favorites in the Malaysian market since then, growing on its success ever so faster. The Bezza was the highest selling A-segment compact sedan with more than 39,000 units sold between the months of January and September last year. The sedan has been completely built in-house with more than 95% local content. It is based on the Perodua Axia, Malaysia’s most popular hatchback. A whole lot of emphasis has been given on the fuel efficiency of the car. The Bezza is also Perodua’s first model to be featuring stop-start idling along with regenerative braking and VSC (Vehicle Stability Control). A 5-star rating from ASEAN NCAP has made it one of the safest vehicle available in the country. The Perodua Bezza comes in five different variants along with two engine options. The Proton Saga Premium has been the biggest competitor for Bezza over the last year and a half. 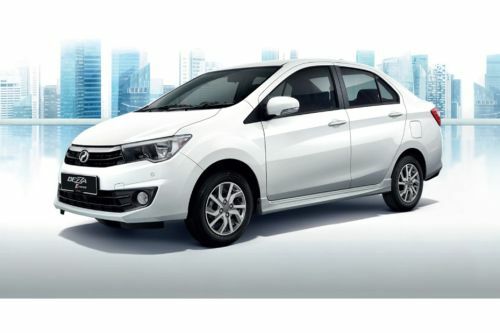 The Perodua Bezza is filled with technologically advanced features, some of which are new to Perodua as well as the other sedans in this price range. Though the back seat of the sedan is not that spacious, the manufacturers have managed to compensate it with some other quality features. Having a boot space of 508-litre, with the rear seats down, the Perodua Bezza is really convenient while going on any vacation. And if that much space is still not enough for you, the seats can be folded and customized in as many as eight different ways so that you can fold them the way you want to as per the requirement. The legroom and headroom inside the vehicle are also good enough. The push start or stop button and the smart key enhance the convenience. The other interior features include quilted pattern leather seats, multipurpose compartment, hand phone slot & USB port, luggage net and an under luggage compartment. The flexible seating arrangements and the other comfort features make it a joy for the driver as well as the passengers. The sedan features a multimedia system with navigation and GPS options along with all the entertainment features. The “Smart Link’ feature allows you to connect your Android smartphone with the system. The Perodua Bezza showcases a sleek design with chrome grille in the face coupled with a chrome back door garnish. The LED rear combination lamps which come with light guides bring beauty along with a utility to the vehicle. The Shark Fin Antenna adds another feather to its wings. The Advance and Premium X variants of the Perodua Bezza come with a lot more stylish and aerodynamic design that bring together the performance and aesthetics. You will find the front fog lamps and chrome outer-door handles in the Premium X and Advance variants. The Advance variant also comes with retractable side mirrors, integrated with turn signals. On the side of the Advance variants, you will also find the side skirting. The Perodua Bezza runs on 14-inch alloy wheels. The 1.0-litre variant of the sedan weighs just around 865 kg while the 1.3-litre variant carry a weight of 930 kg, making both the variants lightweight as per the category standards. The Perodua Bezza is available in the market with six different color options - Ebony Black, Lava Red, Solid Ivory White, Glittering Silver, Ocean Blue and Sugar Brown. The last two color options are only available with the 1.3-liter variant. The energy efficient Sedan from Perodua comes with two different engine options - 1.0-litre VVT-i and 1.3-litre Dual VVT-i engines. Both are solid performers, very fuel efficient and also do well to reduce vibrations and noise. The engines are also very lightweight, which in turn enhances the level of efficiency of the Sedan. The top variant, 1.3 Advance, comes with an auto-only transmission mode, while other variants are available with a five-speed manual or four-speed automatic gearbox. The 1.0-litre engine is capable of churning out a maximum power of 67 hp at 6,000 rpm along with a peak torque of 91 Nm at 4,400 rpm. The three-cylinder engine gets variable valve timing, higher compression ratio, and improved combustion along with reduced friction, all of which ensure a smooth ride. The sedan’s 1.3-litre engine delivers maximum power and torque of 90 hp and 117 Nm respectively. Along with the powerful engine, the Bezza is built with a number of technologically advanced features, which make this sedan a lot more efficient and fun to ride. Its Eco Idle System automatically stops the engine when the car is not moving and restarts when you release the brake which helps in reduction of fuel consumption and emission. The highest mileage delivered by this Energy Efficient Vehicle is 22.8 kmpl. The Perodua Bezza is one of the best sedans in Malaysia when it comes to the safety features. It has achieved a 5-star ASEAN NCAP safety rating which is the best for any Perodua product till date. The manufacturer has equipped the vehicle with a number of other safety features as well. The safety is further enhanced by the VSC (Vehicle Stability Control) which is very useful in detecting and reducing the chances of the car from skidding. The Hill-start Assist feature will ensure that you don’t compromise on your speed while moving uphill. Other safety features include Traction Control (TRC), Anti-lock Braking System (ABS) along with Electronic Brake Distribution (EBD). To enhance the overall experience of this car, the Perodua Bezza comes with features like keyless entry, push start with remote boot release, front passenger seat belt reminder, touchscreen head unit with navigation and reverse camera. What are the Safety Features Available in Perodua Bezza?